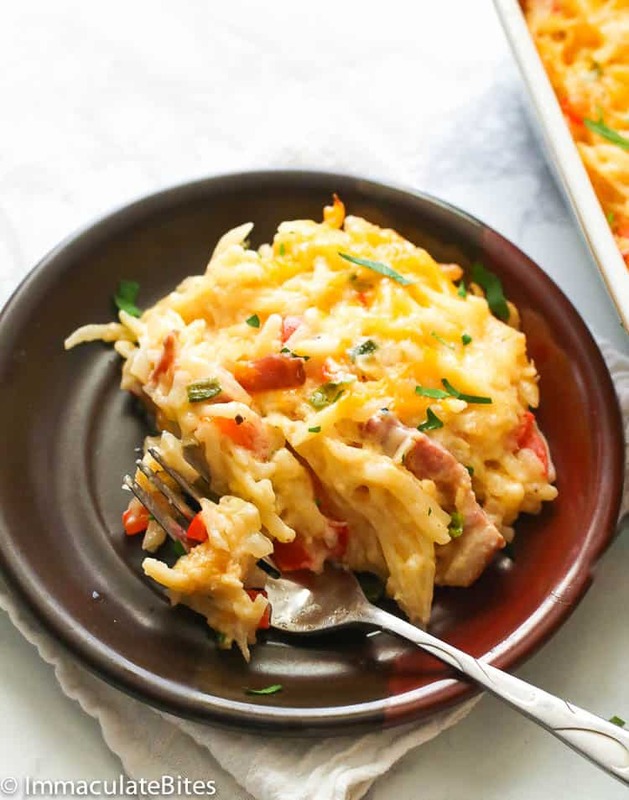 Hashbrown Breakfast Casserole – easy make-head breakfast casserole with tender hashbrown and bacon in a creamy cheesy sauce baked until hot and bubbly. A delicious holiday or lazy days’ breakfast or brunch for the whole family! Although I enjoy cooking more than ever, last weekend I found myself still under the sheets past 9 AM – just way beyond my breakfast prepping schedule. I hurriedly climbed down from my bed and ran towards the kitchen while scrambling my head on what to prepare. There I saw my two boys (hubby and my kiddo), bustling around the kitchen as they set up the breakfast table. Then I remembered that I prepared the casserole the night before. Oh gosh! What a relief! Busy mornings (or in my case, lazy days) surely could use a quick and easy breakfast like this. The word “hash” came from a French word “hacher” which means to hack or chop. So to put it together, hashbrown potatoes literally translates to chopped and fried potatoes. Well, if you’re a fan of McDonald’s, you’ve probably have seen them on the menu or at least ordered them for breakfast. Hashbrowns are actually a breakfast staple here in the U.S. or in North America, in general, and in the U.K. It first showed up on the menu in New York City in the 1890s referring to shredded, diced or julienned pan-fried potatoes. After being shredded or chopped, potatoes are then added with onions and formed into patties before frying. So you probably get where I’m heading at, right? 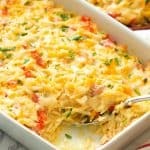 This Hashbrown Breakfast Casserole is a dish usually made with shredded hashbrown potatoes, eggs, tomatoes, chopped onions, sour cream, cheese and more cheese ( 🙂 ) and then baked in a casserole for a lovely breakfast/brunch. A variation of meat are also added in it like leftover shredded or diced chicken, ham, ground beef or sausages to make a complete meal on its own. How to Make Shredded Potato Hashbrowns? – Wash and peel potatoes, then grate them on the largest side of the grater. – Transfer shredded potatoes in large bowl and soak them in water for 5 minutes. – Rinse them in a colander or fine mesh sieve under cold running water until it runs clear. – Using a clean tea towel, squeeze all the water from the rinsed shredded potatoes to draw the moisture. – Place them on a baking tray or sheet to air dry. – Lastly, store them in a ziploc freezer bags and place them in a freezer until ready to use. 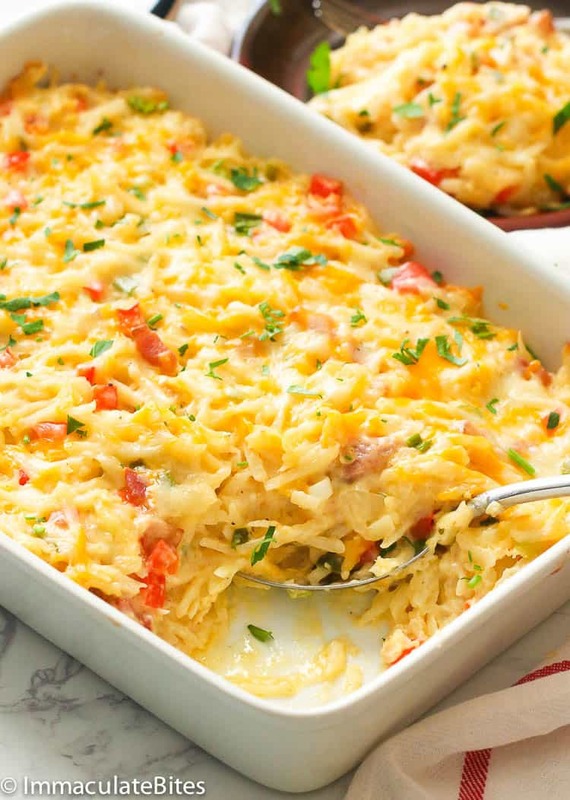 Can I Freeze Hashbrown Breakfast Casserole? This Hashbrown Breakfast Casserole is ideal for make-ahead breakfast and that’s what I love most about it! You can bake it first, let it cool and freeze for up to 3 months. When ready to serve, just thaw it overnight in the fridge and reheat. Meanwhile, you can also assemble it ahead uncooked, wrapped tightly in an aluminum foil or plastic wrap and then freeze. If you’re baking it within 24 hours or the next morning, you can assemble it ahead in the evening and store in the fridge tightly wrapped. 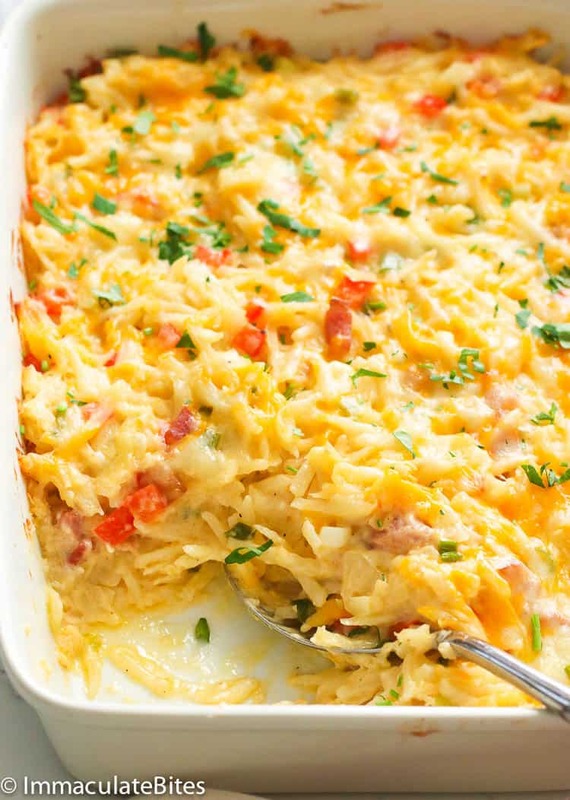 Do you love more casseroles in your life? You’re in the right place. You can check my other scrumptious family-friendly casserole recipes below. You may serve it as a side dish or on its own for breakfast holidays or busy mornings. Feel free to substitute the cheese with your favorite combo or those that melts easily like Fontina, Gouda, Gruyere or Monterey Jack. Preheat oven to 350 degrees F and grease a 9x13 baking dish with cooking spray or oil. Set aside. Add butter to skillet until melted , Then add flour and whisk until fully dissolved. Slowly pour in the milk while stirring consistently followed by the chicken stock. Season with salt, freshly ground black pepper and Creole seasoning and stir. Throw in half of the shredded cheese and stir well until fully melted. Then add the sour cream and stir for about a minute. Remove from heat. In a large glass bowl, add thawed hashbrown, cooked bacon and saute bell pepper and onion combination. Stir well until fully combined. Transfer the mixture into the greased baking dish and top with remaining cheese . Place in the preheated oven and bake for 40-45 minutes. Preheat oven to 350 degrees F and grease a 9×13 baking dish with cooking spray or oil. Set aside. Heat butter in a skillet over medium heat until melted. Then add flour and whisk until fully dissolved. Slowly pour in the milk while stirring consistently followed by the chicken stock. Season with salt, freshly ground black pepper and Creole seasoning and stir. 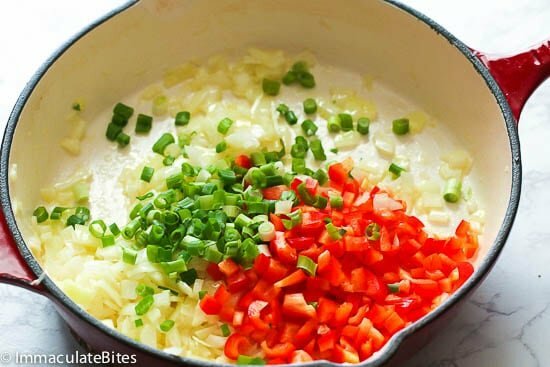 Throw in half of the shredded cheese and stir well until fully melted. Then add the sour cream and stir for about 2-3 minutes. Remove from heat. 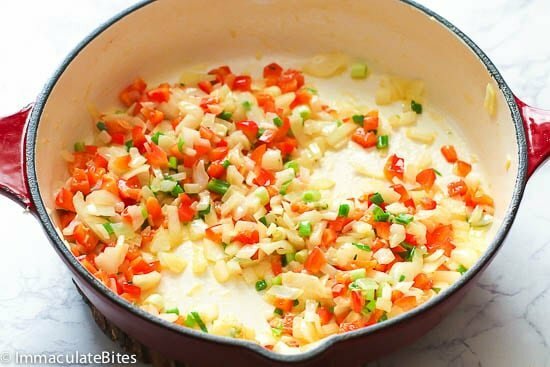 In a large glass bowl, add thawed hashbrown, cooked bacon, onion, garlic, diced red and green bell pepper and the sauce. Stir well until fully combined. Can I use fresh potatoes instead of the thawed ones. Hi, Wendy. Yes, you can. Please see the post above with sub heading “How to Make Shredded Potato Hashbrowns?”. Please do let me know how it works for you. Yes, please. I have been making this more often these past few weeks. 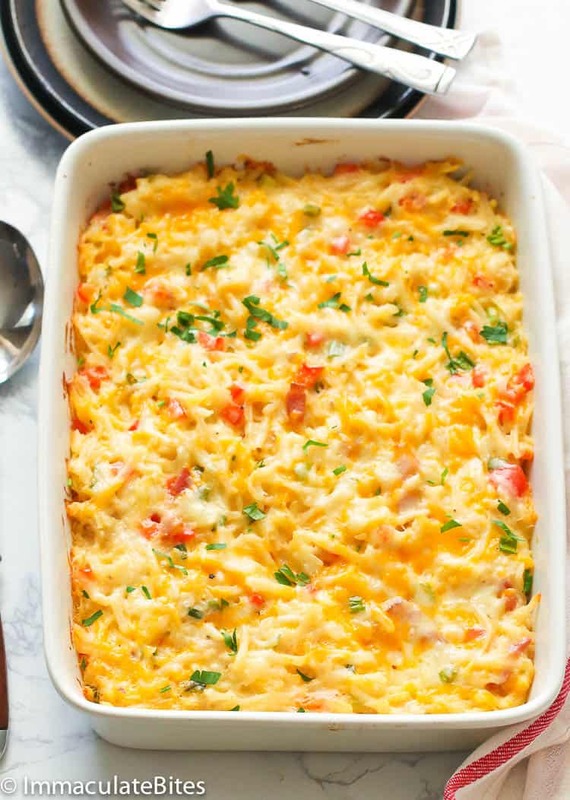 This casserole looks really delicious!